Two Rogue One prequel books are on the shelves: the Jyn Erso-focused Rebel Rising and the Baze Malbus and Chirrut Îmwe-starring Guardians of the Whills. As you would expect, both books drop a fair bit of new canon knowledge and help flesh out Rogue One. Here’s everything you need to know. Rebel Rising covers Jyn’s life from being rescued as a child by Saw Gerrera while she was hiding from Krennic and his forces (we learn that her family drilled for these kinds of emergencies) to her being presented to the Rebel Alliance’s high command. If you felt anything for Jyn in the movie, this book does a marvelous job of delving into Jyn’s psyche and explaining her motivations. You will feel awful for everything she has gone through and, far more than the first Rogue One prequel novel Catalyst, Rebel Rising really adds dimension to Rogue One. If you’re curious about it at all, pick it up. One of the most interesting things in Rebel Rising is how deeply it dives into Jyn’s psychology. Rogue One shows Jyn’s father, Galen Erso, telling her that everything he does is to protect her before he is taken by the Empire and her mother is killed. By the time we see the adult Jyn, she doesn’t have any attachment to her father. Meanwhile, Saw tells everyone that Jyn is his daughter and enforces that lie all the time. He trains Jyn in weapons and unarmed combat and, eventually, brings her on missions as a forger. Her training includes fighting some droids from the Clone Wars, which Saw obviously has experience with. She very much sees him as a replacement father, so his abandonment of her later breaks her all over again. With one father an Imperial and one an extremist Rebel, Jyn tries very hard to wash her hands of every side of the fight. Unsuccessfully, obviously. In Clone Wars, we met Saw Gerrera on his home planet of Onderon as an insurgent against the Separatists that had taken over. During that conflict, he met Obi-Wan Kenobi, Anakin Skywalker, Ahsoka Tano, and Captain Rex. Also during that conflict, his sister Steela died. Saw sees no problem with assassination or civilian casualties. There’s a mission in the book that Saw accepts that involves killing civilians, a priestess, and an Imperial governor in a brutal public attack during a festival. Part of the reason the planet, Inusagi, is chosen is for it’s proximity to Naboo, known as Palpatine’s home planet. Since the Empire is going to label them terrorists anyway, Saw sees no problem with using terror as a tactic. And torture, also seen in Saw’s treatment of Bodhi in Rogue One, is employed by Saw in this book. Saw’s ruthlessness and paranoia collide when he kills an ally that he claims is a spy and, more importantly, he believes knows Jyn’s true identity. As a child, Jyn watches Mon Mothma and Bail Organa plead for people to see what’s happening in the Empire, unsuccessfully. Jyn sees Bail Organa as “the kind of man who’d declare war” but not the kind to have the strength to “actually fight in one.” This helps explain how Jyn recognizes both of them when she’s brought to Yavin IV in Rogue One. We also get a sense of the growing rebellion, as various insurgencies pop up spontaneously on planets in reaction to the Empire’s brutality. At the edges of everything is the growth of what will become Rebel Alliance. We meet Idryssa Barruck, a friend of Saw’s who disagrees with him about his tactics. She talks about having “higher ups” and she has generals. Idryssa also has a “squadron,” which sounds very similar to Phoenix Squadron, the Rebel cell commanded by Hera and Jun Sato in Rebels. Saw’s willing to do some jobs for them, but he’s mostly dismissive that anything that big can actually work. Furthermore, there’s a Twi’lek named Xosad Hozem whom we met in Catalyst. He was in a group of smugglers, including Has Obitt who traveled with Jyn’s mother in her kyber search, and then joined up with Saw’s partisans. Xosad eventually leaves Saw for the group “Idyssa joined,” a “true alliance of fighters.” He turns up recruiting for the Rebels and very meaningfully talks about having seen “the fulcrum.” The codename means nothing to Jyn, to Xosad’s disappointment. Also popping up is the Ante, an information broker who showed up in the Darth Vader comics. He’s mentioned in passing as a possible source of information. A little nugget tucked into Rebel Rising concerns the scarf that Jyn is wearing. The necklace Jyn wears is a kyber crystal, a gift from her father to her mother, and then to her. Early in the book, Saw gives a young Jyn a gray scarf to wear to conceal the necklace from view as kybers are rare. Since all Jyn can tell Saw about her father’s research is that it involved the crystals, Saw worries he necklace could connect Jyn to Galen and make her a target, so Saw has her hide it. We know from Rogue One that Saw and Jyn were separated at one point and Jyn feels he abandoned her. In Rebel Rising we see the mission that caused the split, where Saw, Jyn, and their team was betrayed on a reconnaissance mission to a planet with a mine and factory. The Empire, having removed everything they needed and built what they wanted (one part of the factory is set up to build something huge and it has equipment for kyber crystals, so no doubt it’s making parts for the Death Star), has a Star Destroyer open fire. The traitor who sets them up appears to know Jyn’s real identity, so Saw sends Jyn away and stays to deal with him himself. While Jyn gets away and hopes that Saw will come for her, he never does. He does send a spy to check up on her—a spy Jyn catches—but Jyn still feels abandoned. The teaser trailer for Rogue One famously detailed Jyn’s crimes: forgery of imperial documents, possession of stolen property, aggravated assault, and resisting arrest. Rebel Rising explains how Jyn could be in an Imperial work camp for those crimes and yet not be recognized as Galen Erso’s daughter, whom Krennic wants as leverage. We also get some of the stories behind the aliases listed in Rogue One: A Rebel Dossier. Tanith Ponta was the name of the daughter of a perfectly normal freight hauler that Jyn becomes friends with and the name of the sister of a man Jyn falls for. Kestrel Dawn appears as quick alias Jyn gives to avoid giving her real one. Liana Hallik is the name she was arrested under, after trading her forgery skills to the Imperials for her freedom. As Hallik, Jyn joins a rebel group and inserts a tracking program into their ship. They’re all caught and, shock of shocks, the Imperials go back on their deal and send Jyn to jail. Of course everything in Jyn’s life would lead to the Death Star. As mentioned, the mission on Tamsye Prime that leads to her being separated from Saw has a factory making giant parts and working with kyber crystals. Saw is constantly getting reports of planets of kyber crystals—including Illum, where the Jedi traditionally got crystals for their lightsabers—being hollowed out by the Empire. Galen Erso is even spotted there. Jyn also encounters stories of mines being bought up by the Empire, against the will of the owners. All the material is being seized for the Empire, but people are noticing the amount of ships being built isn’t increasing. We all know why that is. Chronologically, this book takes place at the end of Rebel Rising, since Saw Gerrera abandons Wrea, the base he raises Jyn on, and ends up launching his offensive against the Empire on Jedha. This book for younger readers deals with Baze Malbus and Chirrut Îmwe’s lives on Jedha right before the events of Rogue One, delving into their motivations and their relationship. It’s obviously not as dark as Rebel Rising, but there’s plenty of debates about what can be done, what should be done, and how far you should go. It’s in the official synopsis of the book, so it’s not a huge spoiler, but a huge chunk of this book is given over to Baze and Chirrut’s history with Saw before Jyn Erso, Cassian Andor, and K-2SO arrive in Rogue One. Saw comes to Jedha to fight the Empire. The Empire has, as we know from the movie, occupied the planet to get at its kyber crystals. It’s Saw that seeks out Baze and Chirrut and asks them to fight with his partisans. Baze, angry as he is at the Imperial ruination of his home, is tempted. Chirrut, who mostly just wants to break any cycle of violence, isn’t. Eventually, the two of them need Saw’s help getting supplies for a number of orphans, and then they fight with the partisans in an exchange. As we know from Rebel Rising, the spy part at least is true. But even then Saw showed signs of paranoia that are full-blown by the time of Guardians of the Whills. Well, it might not be all paranoia, since the Empire is undoubtedly not happy with him. That said, you can also see how that mindset led to the basically lunatic man we see in Rogue One. He is well on the road to being the man who would torture Bodhi Rook in this book. And you can also see how the single-minded obsession with the Empire would not mesh with Chirrut’s more faith-driven beliefs. And Baze, while tempted, is not leaving Chirrut. The book also gives a backstory to Baze’s giant gun, which is apparently a MWC-35c “Staccato Lightning” repeating cannon. Baze had a normal blaster that fell apart. He also had a lightbow (used by Chirrut on Eadu and Scarif) from when he was a Guardian. Baze refuses to use it, even though it works just fine, because it was a Guardian weapon. Baze’s unique new weapon comes from an Imperial cache and is weapon meant to be mounted on a vehicle, not wielded by a single person. Baze and Chirrut used to attack Imperial supply ships, taking the food and medicine for an orphanage and giving the weapons to a dealer on Jedha. Baze, after his blaster breaks, Baze takes the repeating cannon from one of the Imperial stashes they stole and adapts it to his personal use. In Star Wars, up until Rogue One, the Force was something we mostly saw with Jedi and the Sith—and, occasionally, the Nightsisters on Dathomir. Guardians of the Whills fills out the universe with a lot more. Baze and Chirrut served as Guardians, of course, to the Disciples of the Whills. The book also mentions the Brotherhood of the Beatific Countenance, the Phirmists, the Weldsingers of Grace, and the followers of the Central Isopter as orders who had a presence on Jedha. The Disciples of the Whills—those in the red robes in the movie—were simply more prominent due to their connection to the giant temple. Throughout the book, snippets from a book called Collected Poems, Prayers, and Meditations on the Force, edited by a Disciple of the Whills, are presented. Mentioned are the Sage of Uhnuhakka, a Sister of Sarrav, a pupil of the Central Isopter, the Clan of Toribota, a Coxixian Prayer, a poet to the Royal Court of Onderon (Saw’s homeworld), Mete Janvaren of Mirial, someone named Laech Min-Glasin, an Ascendant of Mau, and a priestess from D’Janis. Also included in the book are the Jedi Code, the Sith Code, and, of course, the Guardian’s Mantra—which Chirrut chanted throughout the movie. All of this suggests a very widespread interest and belief in the Force which the Empire was clearly devoted to and successful at stamping out, if Han Solo’s derisive reaction to Obi-Wan in A New Hope is anything to go by. Also, two spires in the city were sealed by the Empire but the faith that built them has been “all but forgotten.” I bet there was something the Emperor found interesting in there. In classic Star Wars book fashion, a lot of characters glimpsed for barely a second get fleshed out in the book. Silvanie Phest begins the book by taking Chirrut and Baze to the temple to deal with someone claiming to be a Jedi. Her race, the Anomids, also get described here: they can’t speak vocally and use complex body language. The mask Phest wears allows them to speak to other species. Killi Gim was another background Disciple of the Whills in Rogue One, who gets a sister who isn’t a disciple named Kaya. Killi’s also an older disciple who helped teach Chirrut. She wears a mask because the dust of the planet causes her to cough and the mask helps. She and her sister run the orphanage Baze and Chirrut steal supplies for. 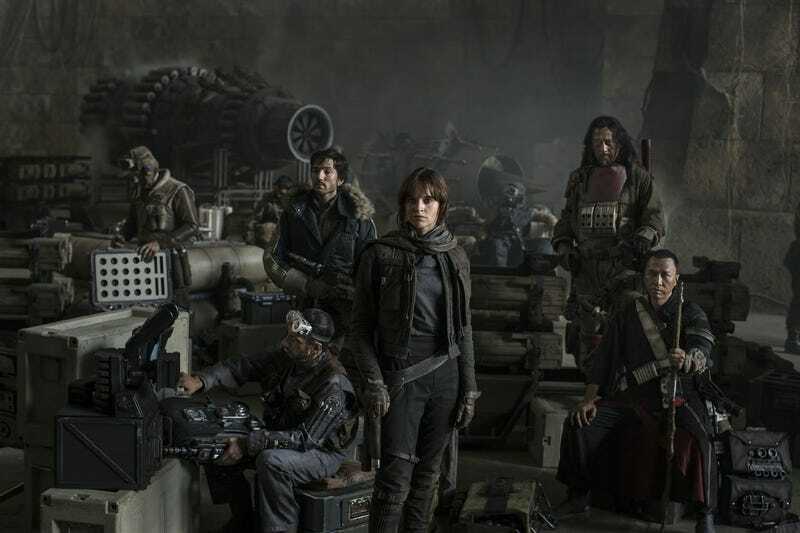 The first of Saw’s partisans to meet Baze and Chirrut are the Twi’lek Beezer Fortuna and the Sabat Leevan Tenza, also background characters in the movie. They work with Baze and Chirrut a fair amount before the latter two split with Saw.